Addison Hutton (1834–1916) was a Philadelphia architect who designed prominent residences in Philadelphia and its suburbs, plus courthouses, hospitals, and libraries, including the Ridgway Library (now Philadelphia High School for the Creative and Performing Arts) and the Historical Society of Pennsylvania. He made major additions to the campuses of Westtown School, George School, Swarthmore College, Bryn Mawr College, Haverford College, and Lehigh University. Addison Hutton was born on November 28, 1834. He grew up in Westmoreland County, Pennsylvania, southeast of Pittsburgh. He was the son of Joel Hutton, a Quaker carpenter, and Ann Mains. At an early age, he became fond of the "solid necessities of building" and enjoyed working alongside his father. Like his father, Addison would vary between carpenting and school. A young man named Robert Grimacy gave him lessons in architecture; it was then that Addison Hutton considered it to be a possible direction in his own life. Parrish Hall, Swarthmore College, Swarthmore, PA (1869). Named in honor of Swarthmore's first president, Edward Parrish, Parrish Hall contains the admissions, housing, and financial aid offices, along with dormitories on the upper floors. Addison Hutton studied architecture with Samuel Sloan, who was a leading Philadelphia architect and author of books on house designs. He supervised construction of the Sloan-designed Longwood in Natchez, MS (1859–62), until construction was abandoned during the American Civil War (stranding Hutton, a pacifist, in the Deep South). He became Sloan's partner in 1864 and was able to bring numerous commissions to their office due to his Quaker connections. By 1868, he had established his own office. 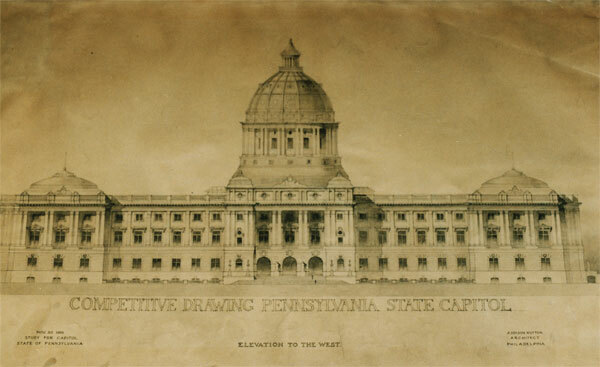 In November 1901, the American Institute of Architects denounced the design competition for the Pennsylvania State Capitol at Harrisburg and strongly urged its members not to participate. Hutton was one of nine architects who submitted designs (his was not selected), and he was expelled from the AIA in February 1902. On October 10, 1865, Addison married Rebecca W. Savery, daughter of William Savery and Elizabeth H. Cresson. They had one child, a girl named Mary, who was born September 1, 1869; Mary married James Garrett Biddle. In 1876, Hutton built a house for his family in Bryn Mawr, PA, near those of several of his clients. It still stands at the southwest corner of Montgomery and Morris Avenues. Addison Hutton died on June 26, 1916, and was buried at Short Creek Meeting House, Jefferson Co., Ohio. His granddaughter has written a biography: Elizabeth Biddle Yarnall, Addison Hutton: Quaker Architect, 1834–1916 (Philadelphia: The Art Alliance Press, 1974). A 1958 photograph of Barclay Hall (1887) at Haverford College. Barclay Hall, named after Scottish Quaker Robert Barclay, was designed by architect Addison Hutton. Historical Society of Pennsylvania, 13th & Locust Sts., Philadelphia, PA (1902). Philadelphia Savings Fund Society, 700 Walnut St., Philadelphia, PA (1869), addition to right (1888). Mirror-image facade addition beyond flag (1897–98) by Frank Furness. "Glenloch" (William E. Lockwood mansion), Frazer, PA (1865–68). Perched on a hill above the intersection of Routes 30 and 202, Glenloch was once an estate of 684 acres (277 ha). 1870 "Braewold", Bedford, New York, listed on the National Register of Historic Places as part of The Woodpile historic district in 1992. Germantown Friends Meeting House, Philadelphia, PA (1868). Arch Street United Methodist Church, SE corner Broad & Arch Sts., Philadelphia, PA (1869–70). Ridgway Library, Philadelphia, PA (1870–78). Now Philadelphia High School for the Creative and Performing Arts. Bucks County Intelligencer Building, Doylestown, PA (1876). Linderman Library, Lehigh University, Bethlehem, PA (1876). Coppee Hall Gymnasium, Lehigh University, Bethlehem, PA (1882). Chandler Chemistry Laboratory, Lehigh University, Bethlehem, PA (1884–85). Bucks County Prison, Doylestown, PA (1884–85). Now James A. Michener Art Museum. Packer Memorial Chapel, Lehigh University, Bethlehem, PA (1885). Packer Memorial Chapel, interior (1885). Carnegie Library, Johnstown, PA (1890–92). Hutton's 1878 library was destroyed by the 1889 Johnstown Flood. This replacement library, built on the same site, is now the Johnstown Flood Museum. ^ Peitzman, Steven J.; A New and Untried Course: Woman's Medical College and Medical College of Pennsylvania, 1850-1998; (2000) Rutgers University Press: Piscataway, NJ. ^ "HSP". Archived from the original on 2013-01-25. Retrieved 2009-01-29. ^ "National Historic Landmarks & National Register of Historic Places in Pennsylvania" (Searchable database). ARCH: Pennsylvania's Historic Architecture & Archaeology. Retrieved 2012-11-02. Note: This includes Martha Wolf (December 1981). "Pennsylvania Historic Resource Survey Form: Charles Thomas House" (PDF). Archived from the original (PDF) on 2014-05-17. Retrieved 2012-11-05. Addison Hutton archival card catalog. Held by the Department of Drawings & Archives, Avery Architectural & Fine Arts Library, Columbia University.